Posted January 23, 2019 by Mitch Hitch & filed under City News, Featured City News. Oxford Street’s woes continue as it lurches further into the abyss with the lockout laws, many retail vacancies and now parking meters having a detrimental impact on this once vibrant and booming strip. And this year retailers are saying that the annual Mardi Gras March can no longer be counted upon to boost to business. In 2015, and again in 2018, the area’s peak business body, the Darlinghurst Business Partnership, conducted an in-depth survey on the impacts of the lockout laws on two hundred businesses and employees. The survey was developed in consultation with the NSW Treasury. Three years after 2015, the latest survey painted an even bleaker picture of business and employee confidence as the impact of the lockout laws worsened. “We did two surveys, one in 2015 and one last year on the effect of the lockout laws on this area and they showed that daytime trade was down about 25 per cent,” Stephan Gyory, president of the Darlinghurst Business Partnership, said. The survey showed that more than half of the recipients felt uncertain in their current employment and 12 per cent felt very uncertain. Perceptions regarding the job market were largely unchanged from the 2015 survey, with 90 per cent indicating that job opportunities had decreased. While the City of Sydney and Destinations NSW are still flagging the area as a gay mecca, 95 per cent of 2018’s respondents indicated that cultural life had declined due to the lockout laws, while just three per cent said that it had improved. When questioned about public safety, the very issue for which the lockouts were introduced, 26 per cent indicated that it was worse, six per cent said that it had improved and 50 per cent indicated that there was no effect. The lockouts have also had a devastating effect on business turnover, with 88 per cent of respondents saying that their turnover had decreased. “You have the evidence that the whole area is under pressure, and the high street faces additional pressure from the internet and the malls,” Gyory said. And with most Mardi Gras events now located in the inner west, shopkeepers can no longer rely on the lead up to the parade for a big boost to takings. Aussie Boys has been in its current Oxford Street location since 1993. “The Mardi Gras has moved out to the inner west with Fair day at Victoria Park, events at Carriageworks, and you have the Seymour Centre and the parade, but the parade is not good for business,” Gyory said. Five weeks ago, the area received another body blow when, without consultation, the City of Sydney installed two-hour meters with tickets into Goulburn Street off Crown Street, where Stephan Gyory’s business, The Record Store, is located. 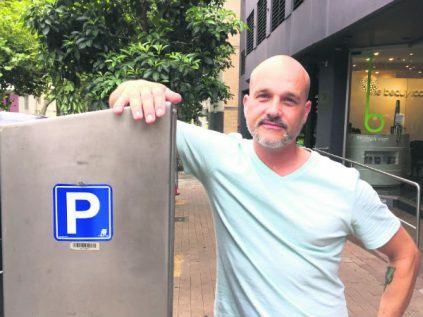 “They just came and put them in without any consultation at all and this has been a 15-minute free parking space for the last 20 years,” Gyory said. Coincidently, the City of Sydney deferred a proposal to install meters between Greens Road and Oatley Street Paddington. Since her 2012 election, Councillor Forster has been vocal about the parking meters in the area. Ken Holmes believes that the vacant shops are now a major part of the problem. “It doesn’t look like a gay street anymore with so many vacant shops,” Ken Holmes said. Last year the City of Sydney put their three buildings on the north side of Oxford Street up for tender and now the streetscape that was once filled with quirky pop up shops is boarded and doorways strewn with rubbish, adding to the gloom.